Regularly incorporating these ten foods into your menus and meal plans will help to keep your heart healthy. Focusing on monounstaurated fatty acids help 'push cholesterol in the right directions' (increase HDL, the good cholesterol, and decrease LDL, the bad cholesterol). Utilizing oils and nuts (as seen in the wonders of the Mediterranean diet studies) has been proven to help decrease incidence of heart attack and stroke. Combine that with a balanced selection of fruits, vegetables, and whole grains and you have a potent combination. 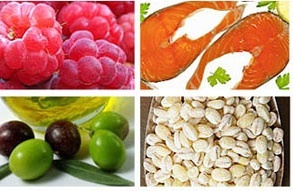 All help increase fiber in the diet, which in turn helps control cholesterol. Selecting whole grains over refined grains also assists in decreasing circulating fats (triglycerides). And last but certainly not least, the fruits and vegetables provide a bevy of vitamins, minerals, and phytonutrients.